The 2017 Travellers Series consisted of 6 events with 4 to count. It went right down to the last event, with 5 sailors all able to win the trophy, however the ever consistent Sam Davy took the honours. The sailing was mostly in light airs, with the memorable exceptions being the second day at Gunfleet and the first day at Chase. This year’s weather was a stark contrast to last year at the Ovington Inland Championships. 5 Solutions arrived to compete at the same time as nearly all other Ovington produced boats types. We were greeted by a sunny morning with near perfect sailing conditions force 3-4. Martin launched and gradually everybody else that had arrived joined him. 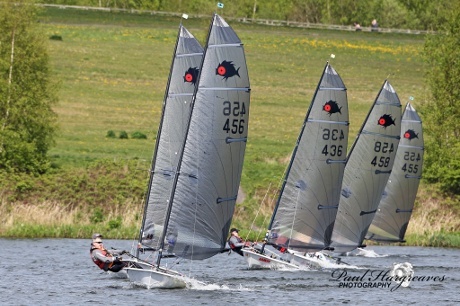 Sharing the course with Phantoms and Flying 15s, the pre starts were sometimes chaotic but every start ran well. The first start saw Christian leading around the windward mark closely followed by Jack and Kathryn. Christian and Jack proceeded to pull away from the rest with Martin managing to catch and overtake Kathryn. Sam arrived before the start of the second race to swell our numbers to 6. This time Kathryn and Jack made the most of a shift that favoured the port side of the course being first around the windward mark. Starting the second lap, the left side appeared to pay again with Jack staying out front as Kathryn graciously made sure nobody felt left out and unfortunately went from front to back. Christian had set his sights on gaining back to back victories and was on the charge. He left it late and on the last beat took the lead despite a last ditch dive to the line by Jack, Christian took his second win. The third race saw Sam and Christian out the front battling for the win. They managed to keep their lead and fight all the way to the line, with Sam breaking Christian’s winning streak and taking the victory. Just behind Jack managed to hold off Martin who was gaining rapidly. With a few different methods on show to try keep warm whilst waiting for the other fleets to finish, Kathryn decided that the clubhouse was now the place to be. This race saw Christian lead from start to finish with Jack defending from Sam to stay in second place overnight. The dawn of a new day that was unfortunately true to forecast with less wind but on the up side and probably most importantly still dry. Sharing the start line with the Phantoms made the starts much more crowded. The first start of day 2 saw the first general recall as many of the Phantoms crowded the pin and were a long way over (I can’t remember if a Solution was over or not). The recall created some confusion as some of the Phantoms were still coming back across the line as the second start went. This made the first beat very hard to see where everybody was but somehow all the Solutions arrived at the windward mark from different directions very close together. Sam, Christian and Martin managed to pull out away from Jack, Kathryn and Kevin. Martin dropped back slightly from the duelling duo up front. Sam managed to hold off Christian to take his second victory of the open meeting. Jack had managed to catch Martin and on the last leg pipped him on the line with Kathryn waiting for any mistake. This time everybody was just about well-behaved and we got underway. Again Sam, Christian and Martin pulled out a slight lead from Jack and Kathryn. All three were having a great battle and with the wind relatively fickle and shifting about everyone had a chance of making gains if they picked the right way up the beats. Sam again took the win in front of Christian and Martin. Another recall as the Phantoms got carried away as Christian tried to sail over the top to the pin and they all successfully pushed him over about 15 seconds early, then carried on themselves slightly defeating the object of fighting with a smaller boat I think. The second start was again extremely close but the race officer allowed it. The same trio of Christian, Martin and Sam pulled away and with several position changes as everyone tried to find the fastest route without just following but by now the wind seemed to be fluctuating so frequently that you could gain 2 places then a minute later have lost them again. Christian finished off the weekend taking the victory followed by Martin then Sam. This meant that Christian retained the Ovington Inlands Championship title for the fourth year running and with Sam beating Jack and Martin this means that Sam takes the Traveller series 2017. On Saturday 7th October, 9 Solutions gathered at Chase SC and were greeted by a lively westerly F4 gusting 5. The Supernovas started first with the Solutions 5 minutes later in hot pursuit. The race officer made full use of the whole lake, with the start line near the dam wall, and a long beat followed by a series of tight and broad reaches. Ross decided to get his customary capsize out the way before the start of race 1, but Paul wasn't so fortunate and capsized early in the race. Jack had the lead coming into the leeward mark with Martin and Kevin in hot pursuit. Martin got a little too close to Jack's transom, and had to do a sudden bear away to avoid a collision, followed by a very wobbly, climb over the side moment, heading towards the dam. A spectacular and lucky recovery avoided a swim, but this let Kevin through and he duly overhauled Jack on the beat to take the win with Jack and Martin following him home. The hot soup for lunch was welcomed by all the sailors, especially those who'd tested the water temperature. Race 2 followed and the fleet rounded the windward mark in a big group. However Kevin made the most of the conditions and disappeared over the horizon with Martin building a substantial lead over the remainder of the pack. Race 3 was back to back, and before long Kevin has assumed his normal position at the front, with Jack in second despite having to do a 360 penalty for hitting a mark. 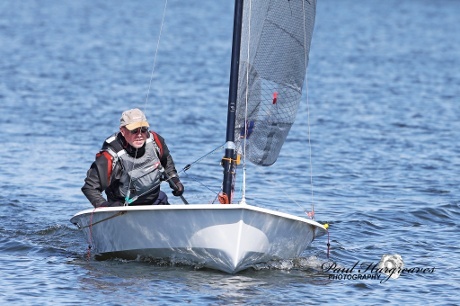 Paul was third until he capsized close to one of the gybe marks. Martin just squeezed inside, Ross did the same but hit the mark in the process. The leaders worked their way through the back markers in the Supernova fleet, but the finishing positions remained unchanged. The Supernovas were only sailing a one day event, but the Solutions enjoyed Chase's excellent curry (and beer) night, to end a great day's sailing. 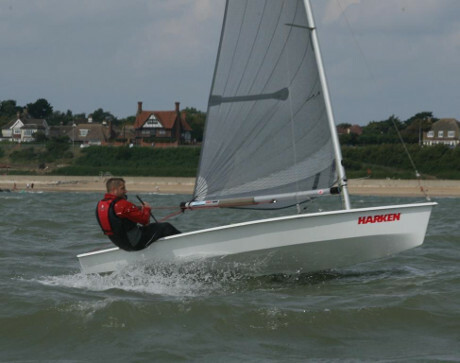 The conditions on Sunday morning were lighter and shifty, but there was still enough wind to make it an enjoyable sail, and once again the PRO did a great job. 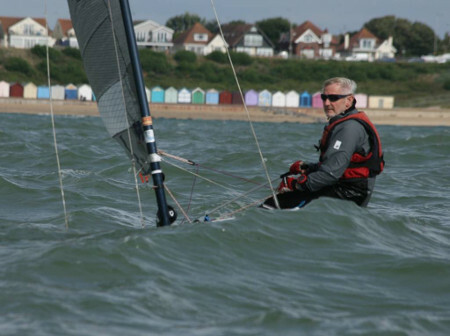 Local sailor Andy Jukes showed the way and took the early lead in the 1st race. 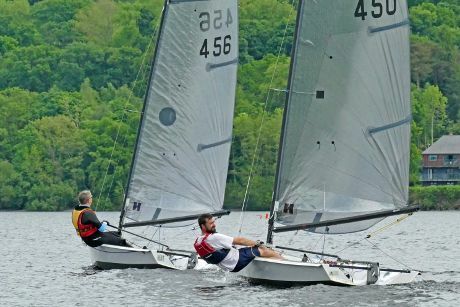 There was some confusion at the leeward mark with Paul wanting to round to port as Kevin and Martin correctly rounded to starboard. Paul earnt a capsize for his troubles and dropped back! Jack pulled through into the lead, with lightweight Ross making the most of the off wind legs to take second, and Andy taking third. Unfortunately Kevin, who prefers the breezy stuff, could only manage 5th. In the second race Martin got a huge lift up the left hand side of the second beat past the island to gain the lead. He held on to take the win, although Ross was catching quickly and took second, with Paul in 3rd. Over a pulled pork lunch the mathematicians worked out that it was still all to play for going into the 6th and final race. Paul improved on his previous results and took the win, meaning a different winner in all of Sunday's 3 races. Ross had his third 2nd of the day, enjoying the conditions, with Andy rounding out the top 3. Martin was 4th and the only sailor to finish in the top 4 in all races. However consistency doesn't always pay, and after two discards Kevin just took the win from Jack on countback with Martin one point behind and Ross a further point back in 4th overall. A big thanks to Chase SC for their hospitality and some great racing. 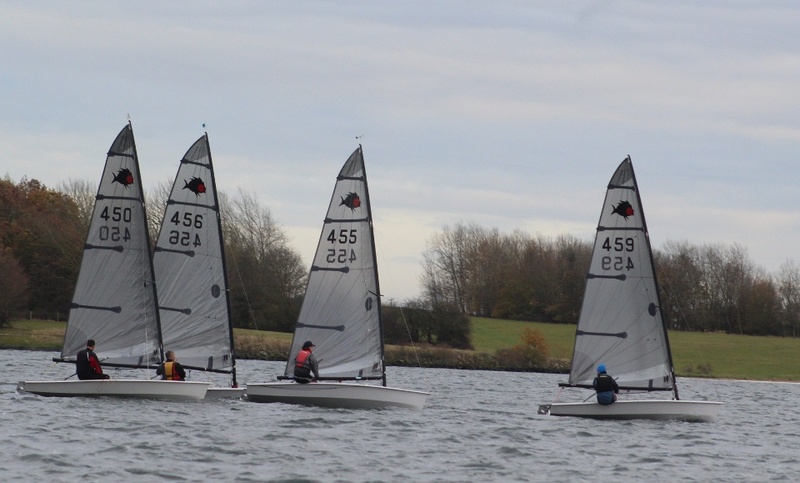 The final event of the Solutions travellers is the Ovington Championships at Grafham on 18th/19th November, where any one of 5 sailors could take the overall travellers trophy. 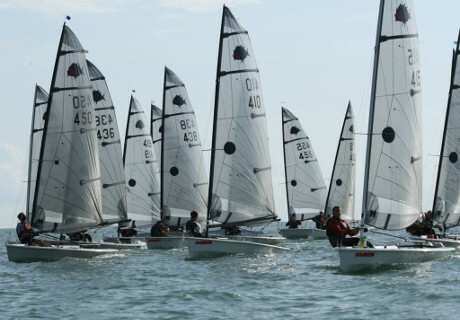 16 sailors arrived for the 2017 Solution National Championships at Gunfleet sailing club. Glorious sunshine greeted everyone on Saturday morning and off everyone went. 1st Race was a triangle sausage course. A delay was had whilst the wind shifted about and the course had to be re-laid. At the 1st mark, Jack, Martin and Christian lead around with everyone chasing hard but it was Nathan and Sam who fought their way through to the front during the long 2 hour race which separated the fleet. For the 2nd race, a trapezoid and sausage course was laid. This would be the same course for the rest of the day. Nathan took an early lead from Sam with Stefan chasing hard but it stayed this way until the end. In the 3rd race, it was Stefan who shot away in an early lead. Sam managed to pass him at the end of the first lap with Nathan just finding a way past just before the end of another long hour and a half race. Sunday brought less sunshine but a fair bit more wind. Again a trapezoid and sausage course was used. Jack, Christian, Kevin and Nathan found the way around the first lap and with Stefan and Sam continued to all swap positions on the way around but on the last lap Nathan and Kevin failed to spot the top windward mark had shifted leaving Christian to take the first win of the day with Jack coming in 2nd and Stefan 3rd. In the 5th Race it was Kev Clark’s turn to show everyone around the course with Nathan keeping very close behind him and Stefan coming round in 3rd. By the last race only 9 boats where left to brave the conditions. Christian took the last win with Nathan 2nd and Stefan 3rd. 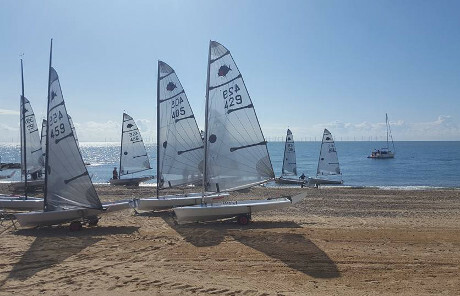 A huge well done to Gunfleet sailing club for doing a fantastic job hosting us with running the racing, keeping us very well fed and keeping our thirsts quenched. Massive thanks also to Nucleus Watersports for the generous prizes and sponsorship and Ovington Boats for the welcome packs and prizes. 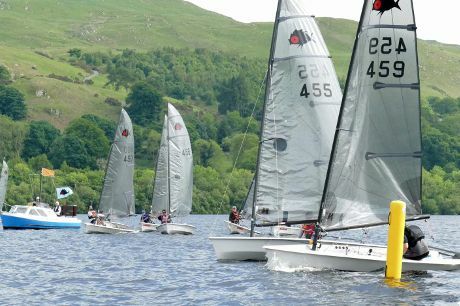 In light and patchy winds the Solution fleet started first, ahead of the slower Streakers, and the race officer made the most of the western end of the lake, setting a figure of eight course. Martin, Sam and Ross got off to a good start, with the wind filling in, unfortunately Ross managed to get momentarily powered up and hiking hard, but with that his wind disappeared and Ross capsized to windward! Local knowledge meant Sam soon overhauled Martin who led for the first lap. Ross recovered well and played catch up ending up 5th. Races 2 and 3 were after lunch, using the same course. By now Ross had dried out and in race 2 he got away for the win. Sam managed to catch up and took second with Jack third. In Race 3 Martin made a better job of working his way through the Streaker fleet, to build a huge lead, almost a leg ahead, but went the wrong way up the final beat to finish well down the field. Sam took the win, with the ever consistent Jack coming in second. We adjourned to the pub just before the rain came, and a lack of wind on the Sunday meant no sailing and an early finish. Thanks to Hykeham sailing club for their hospitality. 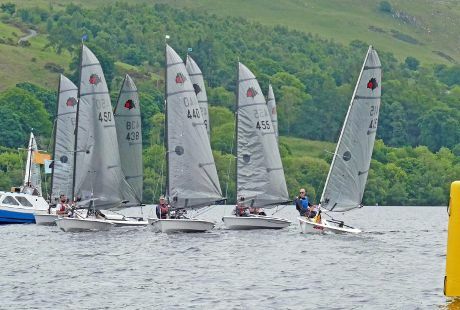 As a warm up several of the Solution fleet entered the inaugural Bala Grand Prix on the Bank Holiday Saturday, and by late afternoon were treated to a full on F5/6 windward leeward course the full length of the lake. Several of the other classes turned back, but Kevin and Martin completed two laps at what was a great fun event. Within the Solution fleet, the finishing order was Kevin, Martin and Ross. Nine Solutions entered the two day Inlands which started on Sunday. The race officer wisely postponed the start on a sunny but still morning, allowing time for boat bimbling, hangover cures to kick in, and a chat with those who wished they still had a Solution. 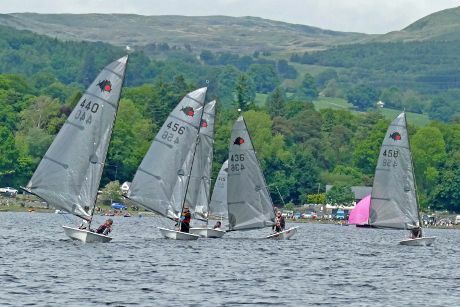 However, as is often the case at Bala, an hour or two later the conditions had changed significantly and following an early lunch an easterly force 3 blew in for 3 back to back races. 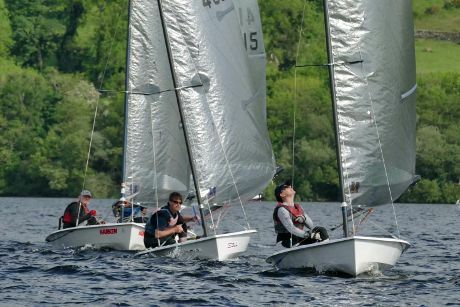 The long first beat back towards the clubhouse proved to be key in all the races, setting the pecking order with fewer changes on the off-wind legs. In race 1 after the usual clean start, Christian was first to the windward mark, followed by Ross, who's sense of direction up the beat was far better than his ability to get back from the pub to the camp-site after a few beers. Paul, Martin and Sam rounded in quick succession followed by the remaining pack. Paul had just flown back from a week's yachting in the Canaries and without a crew to assist, mistakes were made allowing Sam to slip past both Martin and Paul, and Paul fell back behind Martin and Kathryn. Peter got the better of Kevin to come home just behind Paul. Race 2 and the majority of the fleet went right up the first beat but Martin, with Kevin in tow, went left and this proved to be the better option. Martin rounded first, with Christian coming in from the right. Martin held the lead for the remainder of the first lap, before Christian gained the lead on the second beat, and the leading positions remained unchanged, with the ever consistent Sam in third and Kevin fourth. The wind had swung further left and by Race 3 the start line had a slight port bias. Kathryn and Christian took advantage of this and were both "on" the line as the gun went, with Christian looping back just to be safe. The wind held out and by the end of the one lap race it was the usual suspects at the front, led by Christian and Ross. Paul "Basher" lived up to his reputation and anchored himself and Kevin to the leeward mark, allowing some last minute place changes in the tricky beat up to the finish gate. Newcomer Jonathan "Swifty" lived up to his name and improved throughout the day to finish 6th in the final race. Bank Holiday Monday dawned after an evening of curry and beer in the clubhouse and heavy rain for those camping. Unfortunately the wind never filled in and by early afternoon it was mutually agreed to abandon sailing with just Sunday's 3 races to count. The Pembrokeshire duo took first and second, with Martin nipping third after a discard from the ever consistent Sam. Thanks to Bala SC for being great hosts as ever. 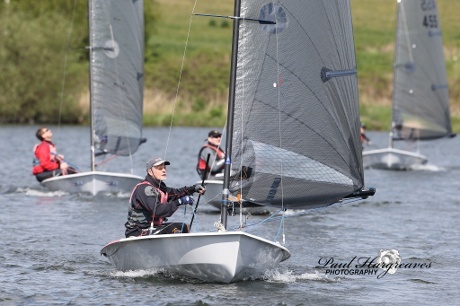 The Solution Travellers Trophy series kicked off at Leigh and Lowton Sailing Club on 22 April 2017. The club laid on more wind than the met office forecast and wall-to-wall sunshine to start the series in fine style. Local boy Martin Tubb led the fleet round the course for the first lap of the first race before doing the gentlemanly thing and handing the lead-boat role to Paul Nix. Paul hung onto first for the rest of the race while Kathryn Clark made the best of the shifts to work through to 2nd. Kevin Clark wasn’t going to let another man come between him and his wife and pushed Martin back to 4th in a photo finish. 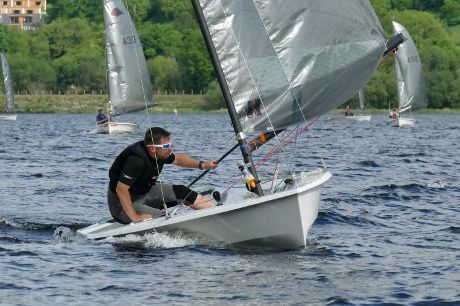 Peter Fisk fought off man-flu to hang onto 5th place while Richard Horovitz made the most of being at only his second open meeting by keeping the rest of the fleet in front where he could see what they were doing to learn from them. The second race started in much the same vein but this time Martin was able to hang onto the lead. Kevin Clark snuck through to take 2nd place and with Paul Nix relegated to 3rd, it left the overnight positions too close to call. Sunday dawned just as sunny but with lighter and shiftier winds than Saturday. The Llandudno pair were unable to join in for the second day leaving the leading four to battle things out. 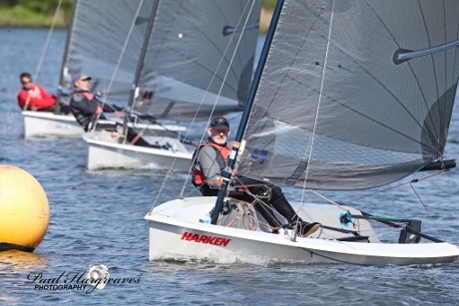 Paul dominated the first two races which gave him the overall win before Kevin Clark took advantage of the increasing wind and port-biased start line to get a bullet in the last race and third overall. Thanks as ever to Paul Hargreaves for the excellent photography.